Bubbles loves pretty clothes as much, if not more, than any girl, so I knew she’d love seeing the fancy hats and beautiful looks for spring. But aside from that, I also had heard that Macy’s was planning lots of fun little events for kiddos and adults alike. There definitely was lots to do. 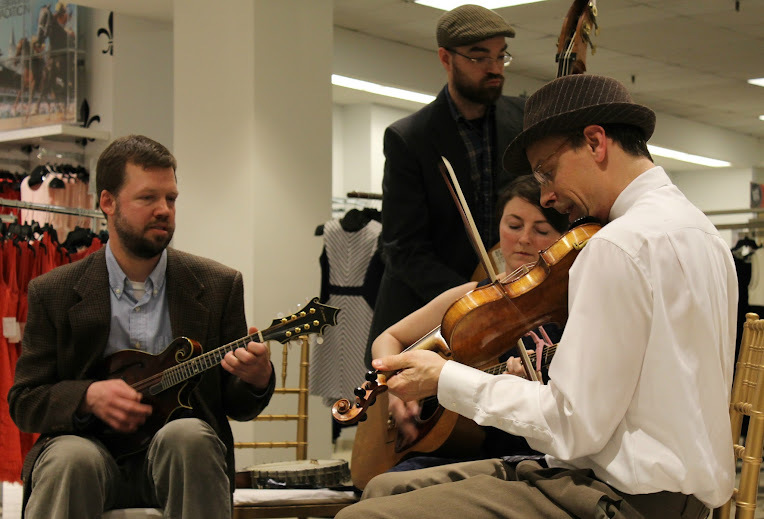 From the moment we opened the store doors, you could tell there was excitement rippling through the building. Music was playing from a number of large speakers, all manned by DJs. Inspiring looks for spring had been curated and were on display in a number of areas. And lots of staff were walking around with small sips and nibbles. One of the first activities we ran into was a photo booth. Bubbles selected a pair of bunny ears and I donned a few leis and we stopped to make some funny faces. As we exited we were offered bite-sized cupcakes which, of course, made Bubbles quite happy. She selected a tie-dye one and was content to nibble on hers as we wound our way to the next stop. 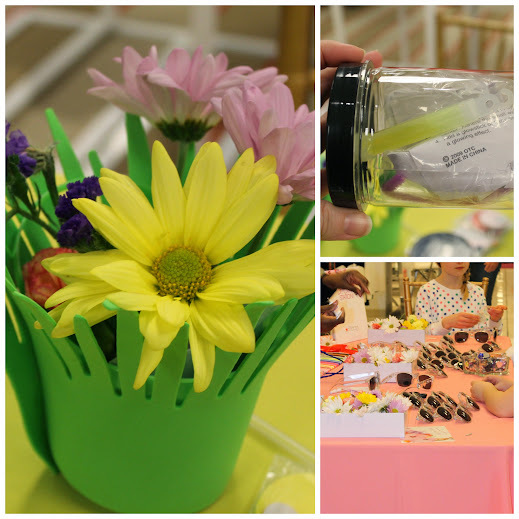 DIY and craft tables were scattered through all three levels of the store. Kids were able to fancy up pairs of sunglasses with stick-on jewels and flowers, or choose from a few different crafts in different areas. Bubbles made a cute little ‘lightning bug’ out of a plastic jar, some stick-on foam pieces, and a glow stick. We also listened to a live Bluegrass band, tried some delicious fresh sips of both water with fruit slices and freshly-made sweet tea, and watched a mixologist make mocktails garnished with flowers. Bubbles was a big fan of the water with strawberry slices; she thinks that’s how I should make it at home all the time now, too. And of course – we can’t forget the fashions. 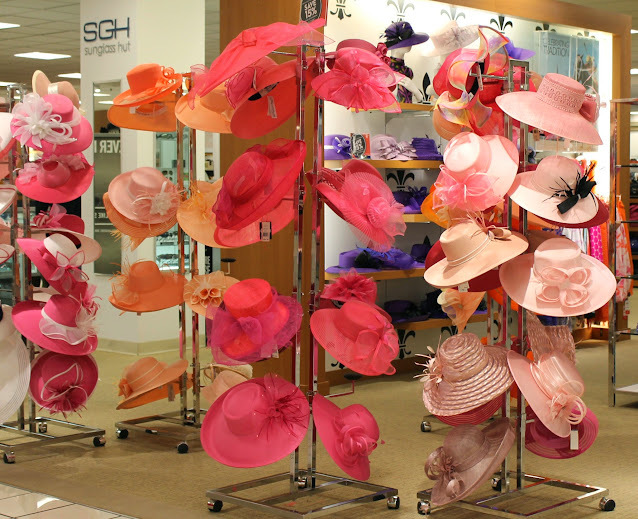 Many spring looks, lots of floral themes, and tons and tons of hats. 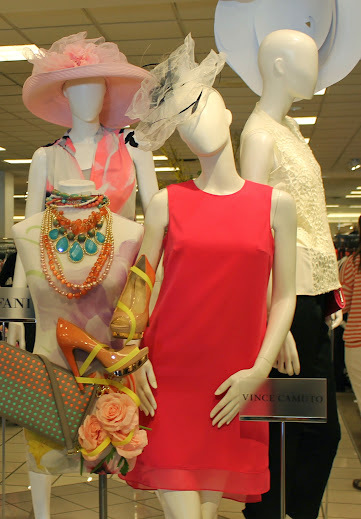 Not sure if all Macy’s locations celebrating spring with Flower Shows or other events would have that many, but it’s definitely appropriate for here and the upcoming Kentucky Derby. Hats are a very big deal for all the events surrounding that. One of my favorite dresses I saw is the one above. I really love the tangerine color. 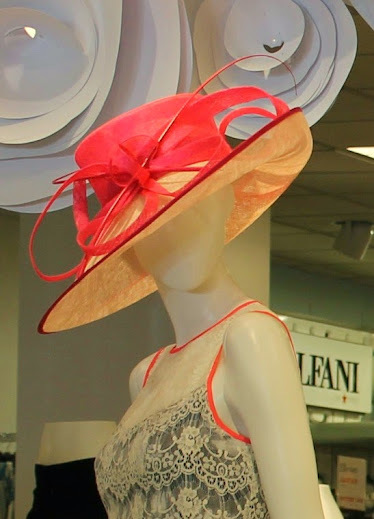 I’m not yet sure what I’m wearing for the Derby this year, but the hat above was one of my favorite ones, too. I hope to find something that it matches! 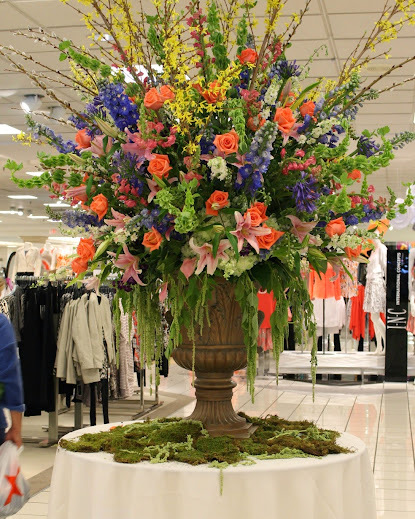 Have you attended a Macy’s Flower Show event? 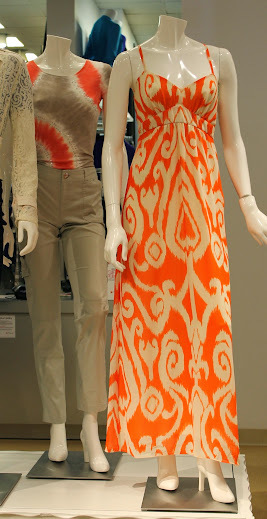 What’s your favorite Macy’s look for spring?